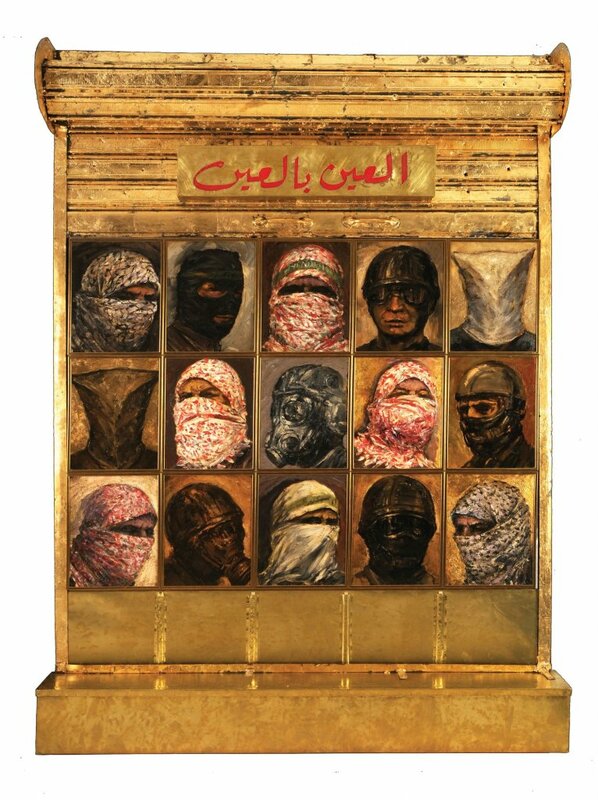 The viewer is confronted by portraits of masked young men, (perhaps self portraits), whose faces are hidden behind a variety of masks, all associated with war: the traditional kaffiyeh, the war helmet, the gas mask and the ominous hood. 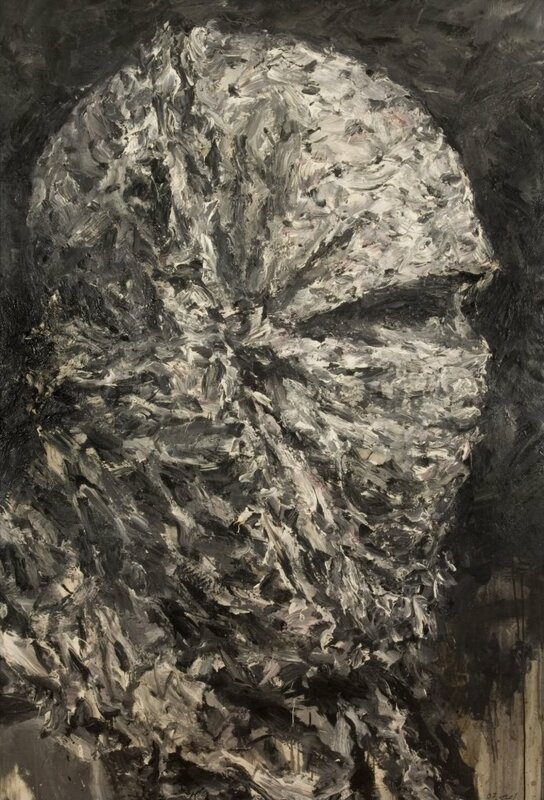 Baalbaki’s use of masks is a complex, multifaceted one. Unlike the classical masks of Rome and Greece, his masks obliterate facial features and thereby hide any visible indication of emotion. Instead, it is his choice of mask that conveys the emotions hidden behind it. One does not need to see the face under the hood to know it hides unimaginable terror. In his constant working and reworking of this motif, Baalbaki’s masks have ceased to be mere devices for protection or the maintenance of anonymity. They have taken on a more fundamental function. He now uses his mask in the same was as primitive cultures used theirs, to mark a shift in a group’s equilibrium, particularly in terms of its relationship to death. In this case, his masks have only emerged in the aftermath of the death and devastation of war. 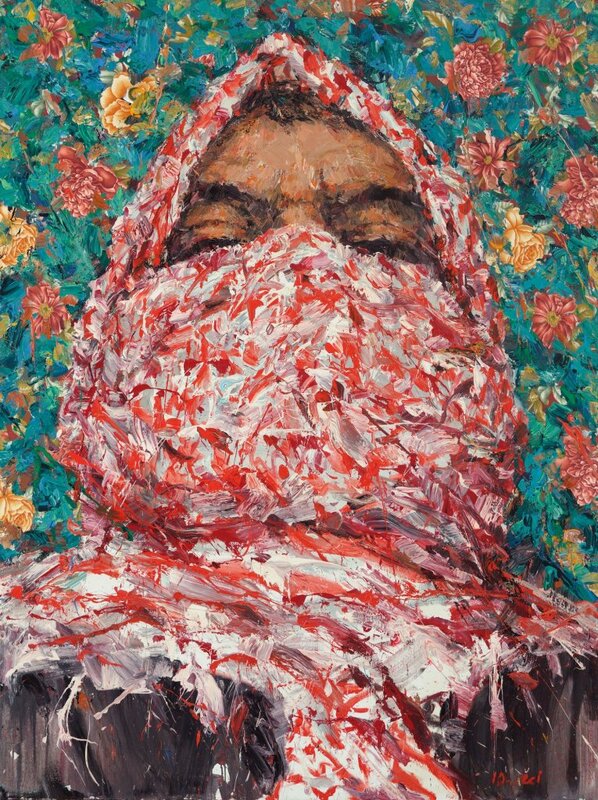 The kaffiyeh figures prominently in Baalbaki’s portraits. 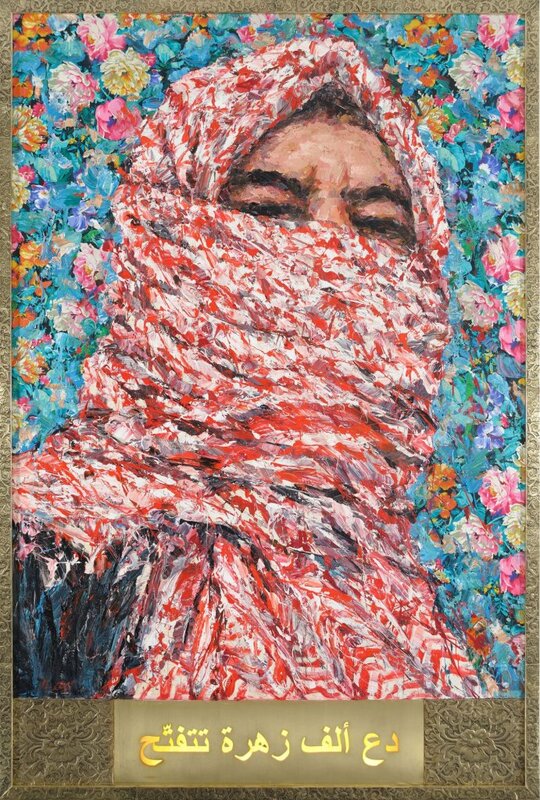 When he first started painting his kaffiyeh portraits, viewers misread the subject as Palestinians although he was painting faces that were also very much a part of the Lebanese Civil War. 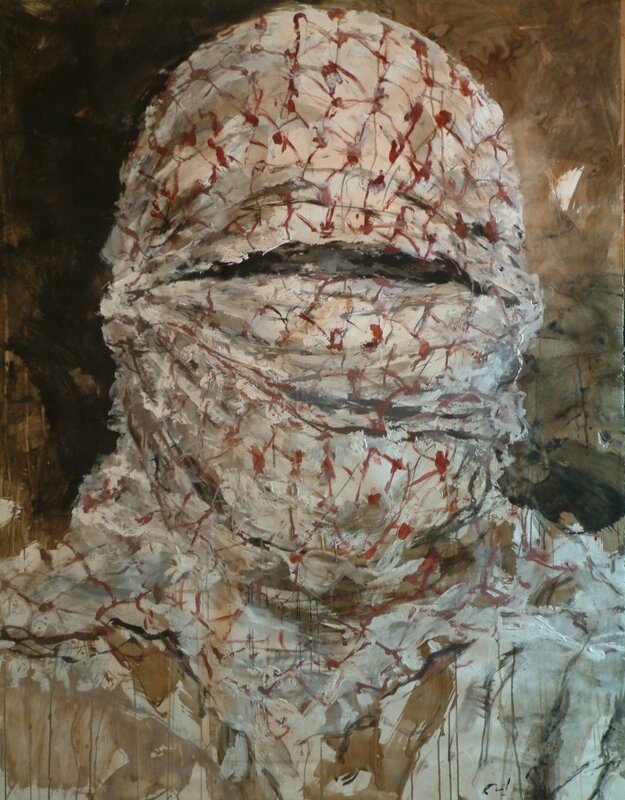 With the Intifada and the war in Iraq, his kaffiyeh-covered faces took on a broader Middle Eastern rather than a Lebanese or Palestinian identity. 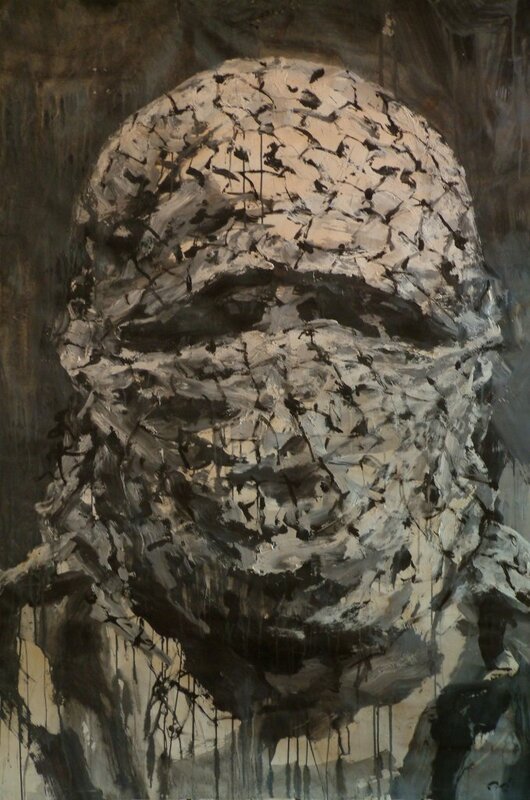 He presents the dichotomy of the kaffiyeh by positioning it alongside portraits of soldiers in gas masks and war helmets and war victims in hoods. 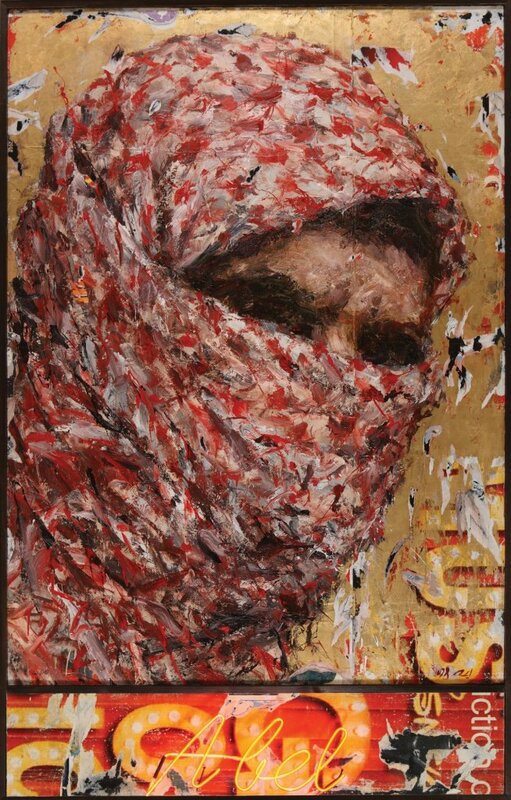 Baalbaki’s use of the kaffiyeh is a direct challenge to the contradictory interpretations that have become attached to what was once a humble headdress used to protect the wearer’s face from raging desert sands. 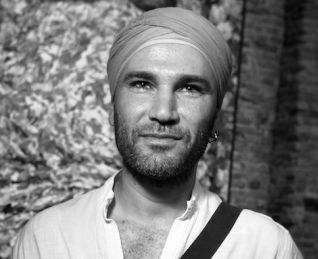 Ayman Baalbaki is a Lebanese artist, living and working in Beirut. He studied Fine Arts in Beirut and at the École Nationale Supérieure des Arts Decoratifs in Paris. 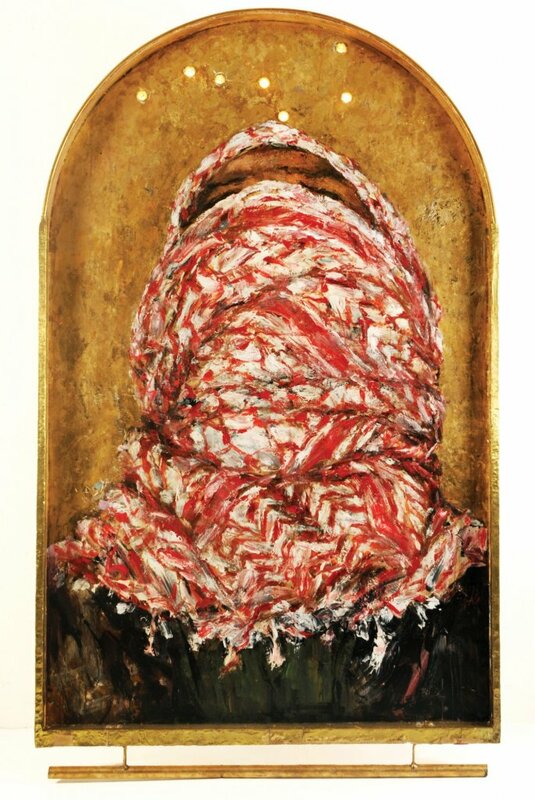 Born during the Lebanese civil war in the 1970s, Baalbaki draws most of his inspiration from this subject matter. In 2012, Baalbaki was part of the The Future of a Promise at the 54th Venice Biennale: the first pan-Arab exhibition of contemporary art to feature in the festival. This exhibition brought together more than 25 recent works by some foremost artists of the Arab world. His work depicted warriors wearing veils or casks. 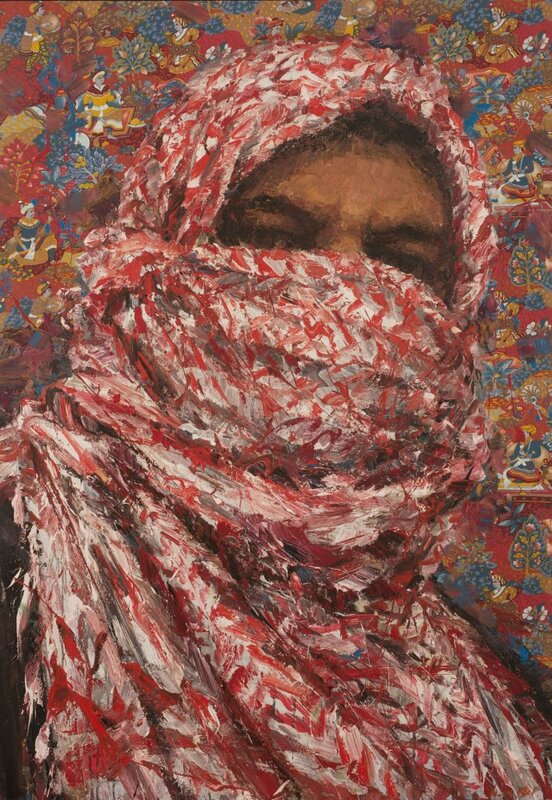 His paintings often describe the seemingly endless conflicts that haunt the Middle East.